Hi, hope you have all been well. On my last day of call-in (a Friday no less) I was instructed to report for jury duty. I am in the middle of the selection process so do not know at this time if I will stay or go, but I have been catching up on all of my reading. That’s always an added bonus. For all the moms out there, I hope you had a lovely Mother’s Day. My husband and kids took me for a yummy brunch and then we headed to Santa Barbara for the day. We checked out all the book stores (new and used) and had a nice, relaxing day. Hope this week goes by quickly. 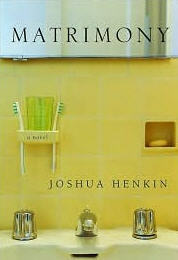 I just finished Matrimony, by Joshua Henkin. This is a story about relationships over a period of 15-20 years and centers around two couples as they go from college into marriage and how they each interact with family members and friends outside of their circle. Henkin does a remarkable job of describing the day to day conflicts. The characters are not perfect, but that makes them all the more believable and the story is very well written. I really enjoyed this book and look forward to reading more of his books in the near future. I heard about this book from Everyday I Write The Book and Gayle was kind enough to send me a copy. Thank you Gayle. She is hosting an online bookclub for this book on May 22nd. If you want more info on this, click here.